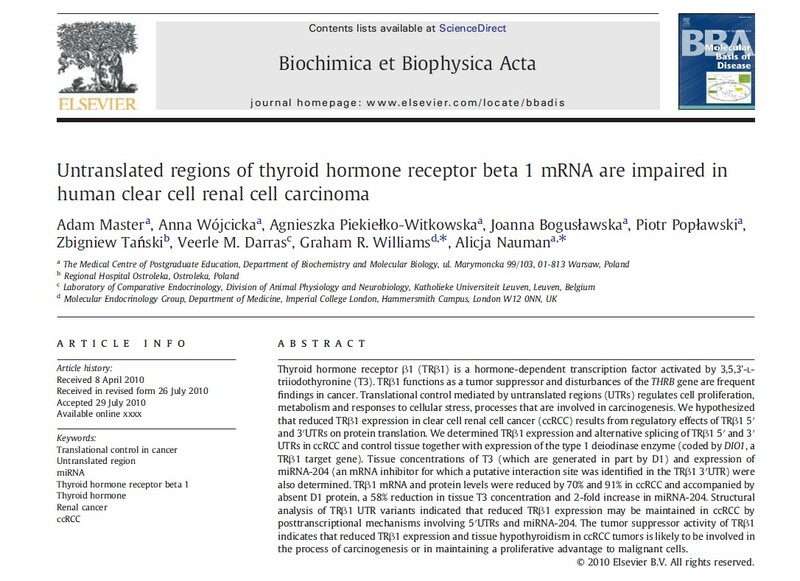 Master A, Wójcicka A, Piekiełko-Witkowska A, Bogusławska J, Popławski P, Tański Z, Darras VM, Williams GR, Nauman A.
Untranslated regions of thyroid hormone receptor beta 1 mRNA are impaired in human clear cell renal cell carcinoma. Biochim Biophys Acta. Molecular Basis of Disease, 2010 Aug 3. Joanna Boguslawska, Anna Wojcicka, Agnieszka Piekielko-Witkowska, Adam Master, Alicja Nauman. MiR-224 Targets the 3'UTR of Type 1 5'-Iodothyronine Deiodinase Possibly Contributing to Tissue Hypothyroidism in Renal Cancer. PlosOne, www.plosone.org, 2nd September 2011. Piekielko-Witkowska A, Master A, Wojcicka A, Boguslawska J, Brozda I, Tanski Z, Nauman A. Disturbed expression of type 1 iodothyronine deiodinase splice variants in human renal cancer. 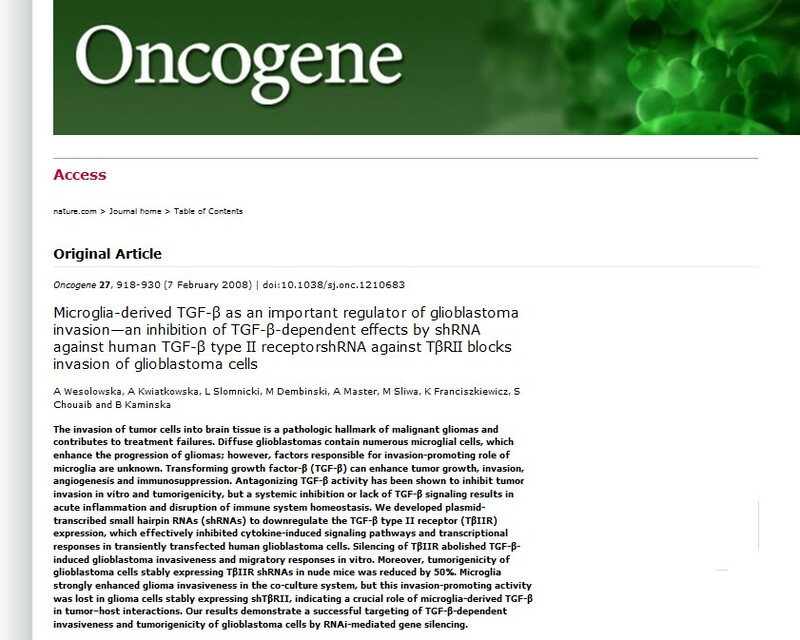 Wesolowska A, Kwiatkowska A, Slomnicki L, Dembinski M, Master A, Sliwa M, Franciszkiewicz K, Chouaib S, Kaminska B.
Microglia-derived TGF-beta as an important regulator of glioblastoma invasion—an inhibition of TGF-beta-dependent effects by shRNA against human TGF-beta type II receptor. Oncogene. 2008 Feb 7;27(7):918-30. Epub 2007 Aug 6. 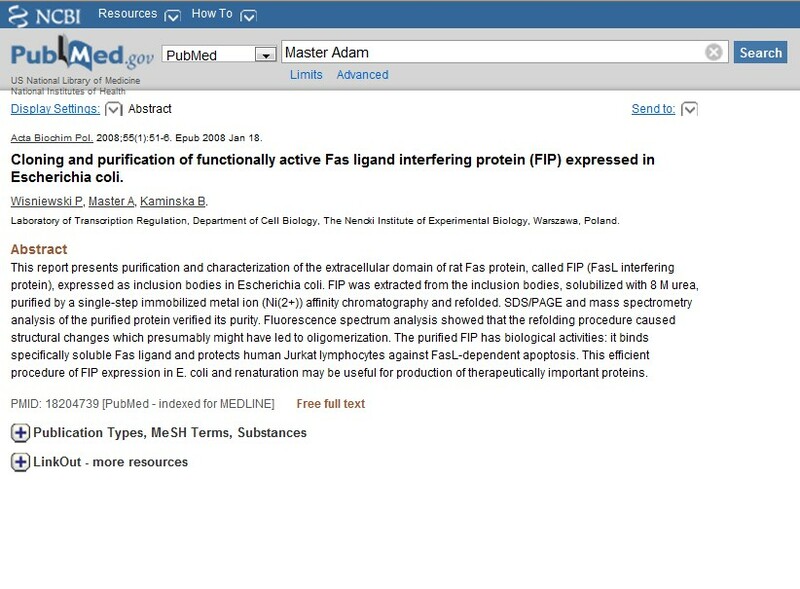 Wisniewski P, Master A, Kaminska B.
Cloning and purification of functionally active Fas ligand interfering protein (FIP) expressed in Escherichia coli. Acta Biochim Pol. 2008;55(1):51-6. Epub 2008 Jan 18. Switaj K, Master A, Borkowski PK, Skrzypczak M, Wojciechowicz J, Zaborowski P.
Association of ocular toxoplasmosis with type I Toxoplasma gondii strains: direct genotyping from peripheral blood samples. Madeja Z, Master A, Michalik M, Sroka J.
Contact-mediated acceleration of migration of melanoma B16 cells depends on extracellular calcium ions. Adam Master , Anna Wojcicka , Kamilla Gizewska , Graham Williams , Alicja Nauman. A novel method for gene-specific enhancement of protein translation efficiency. Adam Master, Anna Wójcicka, Joanna Bogusławska, Agnieszka Piekiełko-Witkowska, Piotr Popławski, Graham R. Williams, and Alicja Nauman. Selective enhancement of THRB suppressor gene translation in human clear cell Renal Carcinoma cells. Master Adam, Skrzypczak Magdalena, Master Aneta, Nowacka Joanna, Plucienniczak Andrzej, Wroblewska Sylwia (authors). Oligonucleotide and polynucleotide for the detecting and determining mutation, particularly hereditary mutation in the p53 human gene, method for the manufacture of this polynuclotide and method and the apparatus for the detecting and determining mutation. Patent number: PL373443 (A1). International classification: C12N15/10; C12P19/30; C12Q1/68; C12P35/00. Application number: PL20050373443 20050307. Publication date: 2006-09-18. Master Adam, Skrzypczak Magdalena, Master Aneta, Nowacka Joanna, Plucienniczak Andrzej, Wroblewska Sylwia (authors). Oligonucleotide and polynucleotide for the detecting and determining mutation, particularly hereditary mutation in the human genes BRCA1 and BRCA2, method for the manufacture of this polynuclotide and method and the apparatus for the detecting and determining mutation in the human genes BRCA1 and BRCA2. Patent number: PL373442 (A1). International classification: C12N15/10; C12P19/30; C12N15/07; C12N15/11; A61P35/00. Application number: PL20050373442 20050307. Publication date: 2006-09-18. Master Adam, Skrzypczak Magdalena (authors). Oligonucleotide, its application and method and apparatus designed for detection of gondiae DNA Toxoplasma gonidii. Patent number: PL358894 (A1). International classification: C07K14/45; C12Q1/68; C12P19/34; A61P33/02; C12N15/30. Application number: PL20030358894 20030226 . Publication date: 2004-09-06.